MrSID (Multi-resolution Seamless Image Database), pronounced "Mister Sid", is a format for raster compression using wavelet technology. MrSID was invented at the Los Alamos National Laboratory (LANL) by Jonathan Bradley and patented in 1995, as patent US 5710835A, "Storage and retrieval of large digital images." The government patent was transferred to a private, for-profit company, LizardTech, organized by a group of Los Alamos insiders. LizardTech thereafter controlled and licensed MrSID. In the early 2000's many US government agencies used MrSID format for publishing images. 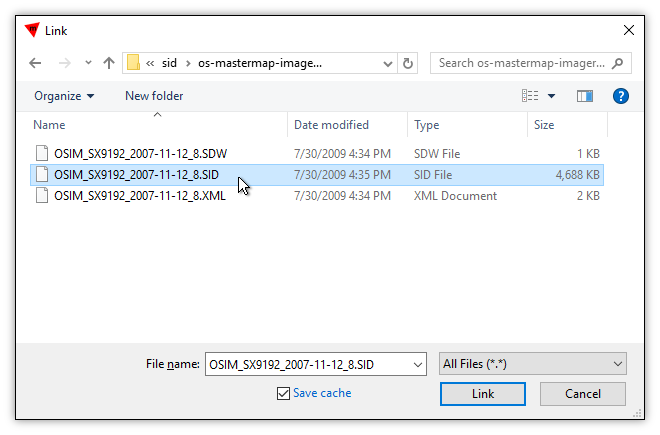 Although MrSID has been eclipsed by newer formats like ECW and JPEG2000, there continue to be very many image files found in archives that use MrSID format. Manifold can directly read those MrSID images without the need to install any other software. Manifold's MrSID dataport utilizes LizardTech code that is built into Manifold to read MrSID format. Manifold support for MrSID is read-only. To export to wavelet-compressed files, use ECW. MrSID as a technology is aimed primarily at viewing data, not editing it. After an image is compressed into MrSID format using LizardTech software, it occupies smaller storage and can be decompressed for viewing relatively quickly by the LizardTech SDK. This is similar to the more modern and faster wavelet technology introduced in ECW. A key idea behind technologies like MrSID and ECW is that relatively few pixels are shown in whatever viewport the viewer displays for the user. An image may be many gigabytes in size but only a few megabytes of pixels will appear on the monitor. If the format provides means for rapidly fetching a rendering of the image at whatever level of zoom is being used, for example, using intermediate levels, the viewer can leave the big image data in the MrSID file and fetch only what is needed to populate those pixels that appear in the display. Another key idea is using compression to reduce the overall size of the image. If the decompression technology is fast it can be used as an essential part of the image fetching mechanism, so that fewer bytes need be fetched to synthesize on the fly the decompressed imagery required for the display. 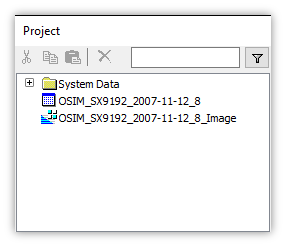 Applications which use MrSID can therefore leave big images in the original MrSID file and link that file into their projects, so that when images are opened the MrSID machinery brings in for display whatever imagery is required. In Manifold we can take advantage of fast decompression of desired parts of a MrSID image by linking the MrSID file into our project. MrSID is not as fast as ECW but it is fast enough to allow leaving view-only data in the original .sid file, and linking that file into the Manifold project. The link creates a data source cylinder that indicates the data is stored outside of the project, in the original MrSID file. When we expand the data source we can see the image within and then we can use that image as a layer in maps. This works well in cases when we only intend to view the image and not to edit it. Linking a MrSID into a Manifold project leaves the imagery within MrSID format, so any manipulation of that imagery is limited to only what MrSID technology can handle. MrSID files are normally stored using compression that involves some degree of data loss. We will not have direct access to the original pixels in whatever was the original image before it was compressed into MrSID: we will only have access to the view that is generated on-the-fly by decompressing the data within the MrSID file. That view will contain decompression artifacts or "noise" that were not in the original image prior to compression. Important: When linking a MrSID file the image that appears in that data source in the Manifold project stays resident in the MrSID file. It is a MrSID image even though it appears in many respects, for the convenience of the user, to be a Manifold image. Choose File-Link from the main menu. In the Link dialog browse to the folder containing data of interest. Click the .sid file desired. Check or uncheck the Save cache box as desired. Press Link. A linked data source will appear in the project. Press the + icon next to the data source to expand the data source to see the image it contains. For our example image we will use a georegistered aerial photograph provided as a sample in MrSID format by the UK's Ordnance Survey. The image is in British Grid projection. The Save cache box allows setting cache options. Most often when linking to a format like .sid, which is fast for links, we will ensure the Save cache box is not checked. We click Link. That creates a data source that contains an image and the image's table in our project. We can double-click on the image to open it. 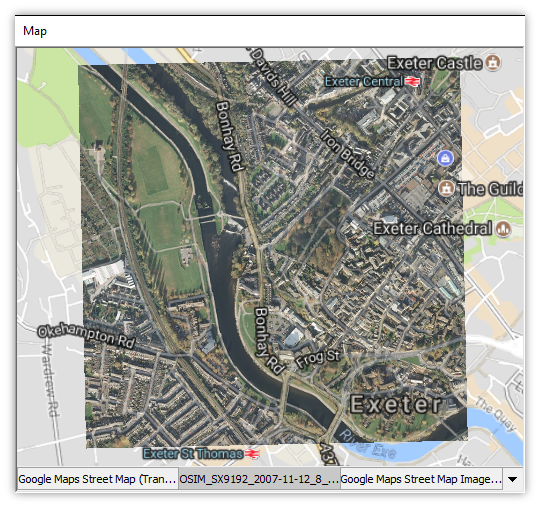 For a more interesting display, we first create a new data source using a Google street maps imageserver as shown in the Example: An Imageserver Tutorial topic. We then create a map and drag and drop the Google layer into the map, and then we drag and drop the image from the data source into the map. The image will be re-projected on the fly from the British National Grid projection used by the MrSID image to match the Pseudo-Mercator projection used by the map. The illustration also shows the addition above the image of a transparent Google layer that labels streets. When we want to do more than just viewing, and to work with images using the full power of Manifold, we can import a MrSID file as a Manifold image. Importing a MrSID file into Manifold decompresses the image into the full content of all pixels for the height and width of the image. That can be very many pixels as images that are tens of thousands of pixels high and wide are commonly found in compressed formats such as MrSID or ECW format. When importing we should expect the import to take a while. MrSID is much slower than ECW for big images so imports of big images from MrSID can take several minutes, even ten or more minutes. The example image used in this topic is only 4000 x 4000 pixels so it imports relatively quickly. Caution: Importing a large MrSID file can take a few minutes or more, and then saving the project that contains a large imported image can also take a significant amount of time. However, once the import is accomplished and the project has been saved, thereafter the project will open instantly. They may run too slowly or may crash when trying to work with such big images. Opening projects containing very large images can take them many minutes or even hours. They do not see much purpose to importing an image that contains compression artifacts as a result of data loss during the original MrSID compression process. Manifold, of course, can handle very large images with great speed so the first issue and second points are not problems for Manifold. The third point we may just have to tolerate if the only source of images for work we must do is a lossy format. Important: When importing a MrSID file the image that appears in the Manifold project is a native Manifold image with no further connection to the MrSID file from which it was imported. It is a native Manifold image and no longer is a MrSID image. Double-click the .sid file desired. An image and the image's table will be created in the project. Double-clicking on the .sid file in the Import dialog as seen above will create an image and the image's table in our project. The imported image uses the same British National Grid projection a the original image in MrSID format. We can double-click on the image to open it. 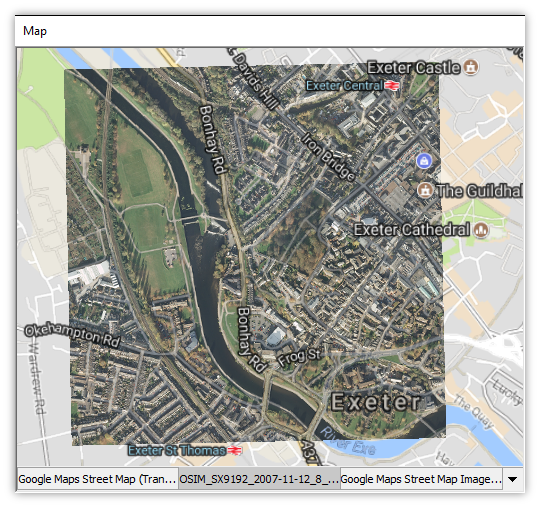 For a more interesting display, we first create a new data source using a Google street maps imageserver as shown in the Example: An Imageserver Tutorial topic. We then create a map and drag and drop the Google layer into the map, and then we drag and drop the ithaca Image into the map. The image will be re-projected on the fly from British National Grid to match the Pseudo-Mercator projection used by the map. The illustration also shows the addition above the image of a transparent Google layer that labels streets. ECW is a wavelet compression technology that has many characteristics in common with MrSID, so much of the discussion of MrSID in this topic has been adapted from the ECW topic. However, the discrete wavelet transformation (DWT) technology used by ECW is significantly more advanced than the earlier DWT technology used in MrSID. ECW's technology is better suited for larger images used in GIS and tasks typical of spatial data. That is not surprising given that the DWT technology in MrSID arose from an FBI need to store and retrieve relatively small grayscale images of fingerprints while the DWT technology in ECW arose from ERMapper's extensive experience with large, digital images typical of GIS and spatial work. Third party comparisons over the years indicate ECW tends to produce better quality images that are compressed to smaller storage sizes than MrSID. Directions Magazine, a GIS industry journal, commented in a comparison of the two technologies, "ECW compressed images appear more faithful to the original without excessive noise, required less system resources to run and had a faster raster display plug-in for GIS." ECW normally is faster than MrSID. The speed difference might not be noticed when linking smaller files but when importing files of any size, but especially larger files, ECW usually will import faster than MrSID. ECW format also has the advantage of being a read/write format as a result of the wide availability of compression SDKs to enable third party applications to write ECW. Manifold, for example, can write ECW files up to 500 MB in size with no need for any other software. Both MrSID and ECW are effective technologies for compressing large images into smaller form from which visual displays can be quickly generated. MrSID is a good, reliable technology. But ECW is a better technology. 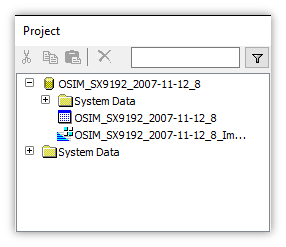 Given a choice between files in ECW format or in MrSID format, choose ECW format. A difference from Release 8 - Due to prior LizardTech licensing limitations, Manifold GIS systems prior to Radian did not include LizardTech code to link or to import MrSID. Users were required to download and to install separate LizardTech utilities to enable Release 8 to read MrSID files. That is no longer necessary. Manifold now reads MrSID directly. As the expiration of the MrSID patent drew near, LizardTech eliminated key restrictions on the MrSID SDK, allowing Radian and later generation Manifold editions to bundle within Manifold the LizardTech SDK. MrSID files can therefore be directly linked or imported by Manifold using LizardTech's own MrSID code as a built-in capability with no need to download or to install any other software. Celartem / Extensis - LizardTech was acquired by Celartem, which does business as Extensis. The LizardTech SDK for MrSID is therefore now copyright © 1995–2018 Celartem, Inc., doing business as Extensis. UC California - Reading about MrSID we may be surprised to see the original MrSID patent was assigned by the named inventor, Los Alamos lab employee Jonathan N. Bradley, to the University of California, and not to Los Alamos National Laboratory (LANL), the organization that invented MrSID. That is a result of one of the world's great administrative ironies. During the great expansion of nuclear weapons development following WWII the US Government contracted with the University of California to be the administrator and manager of both of the government's nuclear weapons design laboratories: first at Los Alamos and then the Livermore lab as well. To this day, a University that is a famously anti-military organization continues to run the nuclear weapons design factories which have created by far the greatest variety and quantity of the world's most lethal weaponry. Patents arising from inventions at the Los Alamos and Livermore labs therefore are routinely assigned to the University of California. Despite the overlordship of UC California, LANL publications indicate the Los Alamos lab seems to have a decisive role in technology transfer decisions involving patents. Expired Patent - According the US Patent and Trademark Office's patent term calculator the MrSID patent expired in 2015. Why, then, does Manifold license the LizardTech SDK instead of simply decoding MrSID directly? 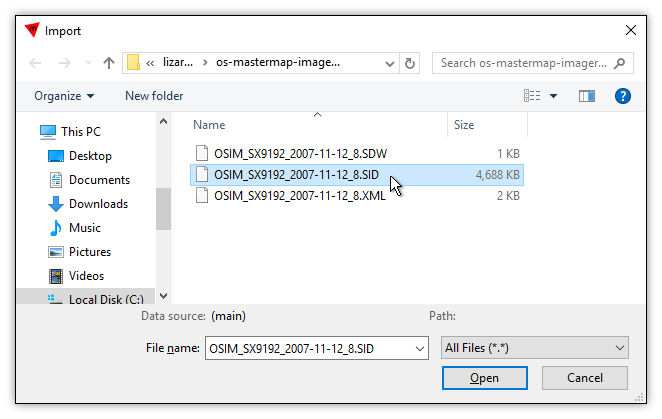 Using the LizardTech SDK provides greater assurance that the results of decompressing a MrSID file will be compatible with what proprietary LizardTech SDKs have put into MrSID files over the years. Manifold therefore uses the LizardTech SDK.